The delicate tinkling of wind chimes - the sound of summer in Japan. Every summer at Kawasaki Daishi Temple in Kanagawa prefecture artisans from around Japan sell their handmade wind chimes, making it the place to go for a true summer experience. Picture yourself sitting on a tatami mat, waving a fan lazily at yourself as you enjoy a bowl of kakigori. The only thing missing from this scene is the gentle chiming of a furin nearby. 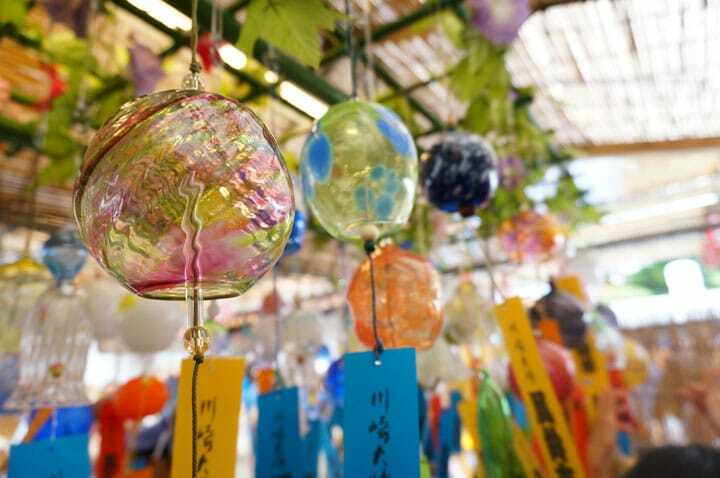 Furin are an essential part of the Japanese summer experience, and at Kawasaki Daishi Temple in Kanagawa prefecture, there is an annual Furin Market that you just have to see - or hear - to believe. Furin or wind chimes, are a decorated bell constructed from a number of materials, including pottery, porcelain, glass or iron, with a piece inside to strike against the bell when blown by the wind. These are usually hung outside of windows or from eaves in the summer. During the Edo era, alongside the drum and insect peddlers, a wind chime seller was one of the many people that could be found in the city market in summer. This haiku expresses the author's desire to be relieved from the heat of the summer by the sound of the wind chime, and the breezes that blow them. Just by hearing the wind chimes, the Japanese of the past and today found themselves feeling cooled in the sometimes stifling heat of summer. The various sounds of wind chimes are sure to have you feeling cooled in no time today as well. There is an incredibly popular Wind Chime Market held at Kawasaki Daishi Temple for five days every July. There are about 30,000 wind chimes in 900 different varieties crafted by artisans from all across Japan for sale here each year. The road to the temple will be packed with people, as many come here to buy wind chimes every year. The sheer number of people and the sounds of the various wind chimes may be a bit overpowering at first, but once you get used to it, you will invariably be able to hear the difference in sound each type of wind chime makes. One of the most popular chimes is the Yakuyoke Daruma Wind Chime, which is said to drive away evil spirits and ward off bad luck. Many visitors come specifically to buy this type of wind chime in fact. Now let's take a closer look at some of the many wind chime types found in Japan. Bizen-ware wind chimes from Okayama prefecture; they are made from pottery. There are many different sizes and shapes to the wind chimes, all of which vary by region in Japan. Kitakata gold/silver lacquer-ware wind chimes from Fukushima prefecture; made from glass and lacquer-ware. Kyushu Hakata wind chimes from Fukuoka prefecture; made from glass. The beautiful Kishuu wind chime is actually made from old whiskey or wine bottles. Kishuu wind chime from Wakayama prefecture; made from glass. Bidoro glass wind chime from Okinawa prefecture. Takesensuji wind chime from Shizuoka prefecture; made from bamboo and iron. Time seems to just fly by as you look at and listen to the different types of wind chimes all around you. Produced glass wind chimes from Kawasaki city, Kanagawa prefecture. Goten Mari wind chimes from Akita prefecture; made from fabric and iron. Now that you've had a look around at some of the different options, it's time to chose a furin for yourself. Find the one that best suits your tastes! One option when selecting a wind chime for yourself is to look for one that you like the design or shape of, as wind chimes are not only enjoyed with the ear but also with the eye. There are many different shapes, colors, patterns, and designs to choose from at the market. Apple wind chimes from Iwate prefecture. Apple-shaped wind chimes are a popular item from Iwate prefecture, and there are also cat and bear shaped wind chimes here too. Produced glass bear wind chime from Kawasaki city. I found one that really interests me. You might see one that just catches your attention for no reason in particular - in that case, it's probably the perfect wind chime for you. Animal wind chime from Mino city, Gifu prefecture; made from pottery. There are many traditional Japanese motif wind chimes here as well, such as Mt Fuji shaped, or the ever popular Japanese summer item, pig-shaped katori senko mosquito coil burners too. Seto-ware wind chime from Aichi prefecture; made from ceramic. Kamo wind chime from Shizuoka prefecture; made from glass. If you'd prefer to choose your wind chime based on its sound, then taking a look at the materials involved is very important. The sound of the chime is affected by its parts, which made be made from glass, stone, pottery, iron, and even bamboo. Bamboo wind chime from Kyoto. Wind chimes made from bamboo tend to have very quiet, soft sounds to them. Bincho charcoal wind chime from Wakayama prefecture. Wind chimes made from stone or charcoal are quite a rarity, but they have a very pleasant sound to them. Stone wind chime from Ibaraki prefecture. If you are looking for a resonant, strong wind chime, then the Nambu wind chimes are ideal for you. These iron wind chimes are popular with those who feel the sound of the wind chime is most important. Nambu wind chime from Iwate prefecture. Wind chimes are the most recognizable sound of the summer in Japan. Why not come visit this unique wind chime market at Kawasaki Daishi to find a piece of Japanese summer to take home with you?